My week has been rough. My week contained so many variables; some favorable and some unfavorable. (I'll admit it, I have an accounting background.) I've been blessed. I've learned things. I've been schooled. I've lost my temper. I've exercised self-control. I went to the movies. I ate out too many times. I weeded my pool fence. I broke my left prosthetic. I made me a new left prosthetic. I could go on, but you get it. It has been a week! Divorce hurts. It hurts everyone it touches, especially this ex-mother-in-law. Divorce is one of those excruciating hurts like a kidney stone. You know you have a stone. You wake up feeling pretty good and BAM! Within the next five minutes the blood supply is cut off to your kidney! You immediately find yourself rolling around in the floor begging, screaming, praying for comfort, even if it's only for the shortest while. The pain subsides. You think it's over but here it comes again...worse. Divorce is necessary. My parents' 60th wedding anniversary was yesterday. Kudos to them! Steve and I will celebrate 33 years in November. Divorce was not in my vocabulary until God showed me, sometimes, it is so necessary. I couldn't even ask him to stop it. Divorce is ugly. I can't find one thing pretty about divorce. My daughter's tears of sorrow are ugly. My grandchildren riding off for the weekend is ugly. The destruction of the completeness of my family is ugly. The mistrust and resentment are ugly. Being wronged is ugly. Period. Unconditional love is unstoppable. It is difficult for me to understand why I still love my ex-son-in-law so much. He makes me so mad I could rip his head off! But, I can't stop loving him. I can't stop feeling for him when he creates his own demise. I can't stop making concessions for him when he deserves none. God's love in me for him cries out for mercy, grace and above all, forgiveness. If unconditional love were stoppable, Jesus would have succumbed under the weight of the cross. He fell, but got back up, not once but three times. Praise be to Jesus for his love for us! I can't change things. This is the hardest lesson ever. 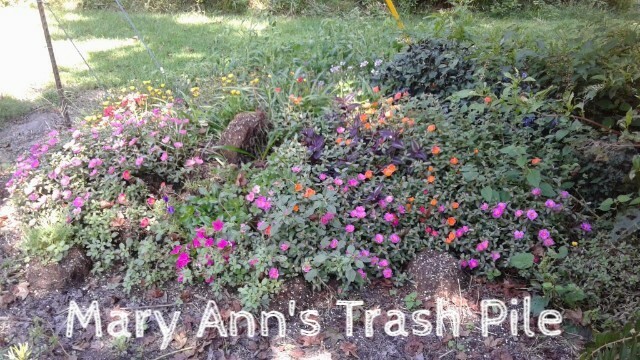 Today, when Mary Ann sent me the photo of her trash pile, it hit me. Mary Ann threw out what she couldn't get to grow. She gave up. Her plants flourished. God showed me I must give up my ex-son-in-law. Quit hoping he will grow. Stop wishing he will be different. I'm asking Jesus to help me release him so he can find his way into the good God has prepared for him. I'm praying my release will somehow help him find a better life. I can do nothing but God can morph a caterpillar into a butterfly. And that, is a beautiful thing!